Production Supervisors Dale Oliver and Ricky Lake have recently attended the ‘Fundamental Skills for the New Supervisor or Team Leader’ course. The course was ran by Activia with the aim to enhance a wide array of skills involved with leading and supervising. Both Dale and Ricky found the course of great benefit and EMC as a company have already profited from their development. This was not the only training course recently attended by an EMC employee. As, following the recent audit, our Quality Assurance & Technical Director Aron Hicklin attended the ‘IATF 16949:2016 (Automotive) Internal Auditor’ course. 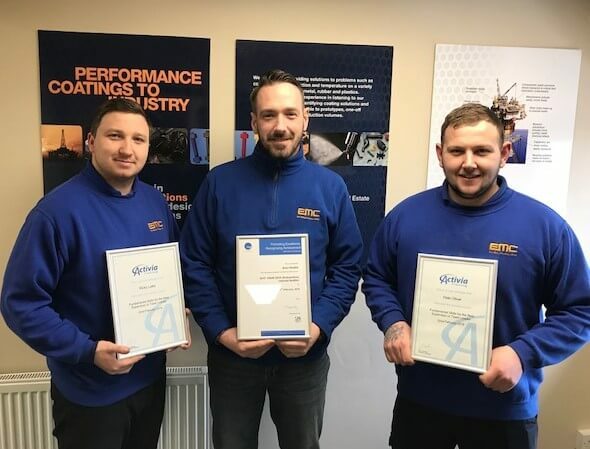 Following the transition from TS 16949, the aim of this course was to provide Aron with the knowledge, resources and skills required to successfully audit to IATF standards. Following the course, Aron has already conducted an internal audit and implemented continual improvements that will benefit our processes. One of the most important things for East Midland Coatings Ltd is the development of our staff. Training our employees not only benefits the company in terms of fresh ideas and concepts, but also benefits the individual with their own personal development. This is an area that EMC significantly invest in, as demonstrated by the recent courses that Aron, Ricky and Dale have attended.